Dr. Radin Dardashti, Dipl.-Phys., MSc. Radin Dardashti studied physics (theoretical particle physics) at the RWTH Aachen University (Dipl.-Phys.) and philosophy of science at the London School of Economics (M.Sc.). He then started working as a doctoral fellow at the Munich Center for Mathematical Philosophy, Ludwig-Maximilians University Munich, on questions of scientific methodology in modern fundamental physics (title: Challenging Scientific Methodology: Theory Assessment and Theory Development in Modern Fundamental Physics; supervisors: Prof. S. Hartmann, Prof. R. Dawid). He has been an assistant professor at the Institute of Philosophy, Leibniz University Hannover since October 2016. 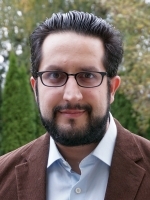 Radin Dardashti is interested in the various ways scientists (especially physicists working on fundamental physics) reason in theory development and theory assessment.